The Tusk Aluminum Suicide Doors are the perfect addition to your RZR 570, RZR 800, RZR 800 S or RZR XP 900. These bolt-on Tusk UTV doors are made of lightweight yet durable 6061 aluminum tubing with lightweight aluminum door panels to help keep you and your passenger safe from the elements. Equipped with a secure pin style latch system, the Tusk UTV doors ensure that they will not be opening unwantedly. One of Tusk UTV's goals is to provide some of the best quality for the lowest price. 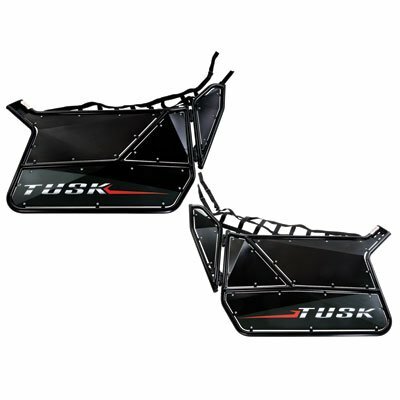 Remember Tusk for all your UTV parts and accessories! Door frame made from lightweight yet durable 6061 aluminum tubing. Aluminum door panels to help protect from the elements. Multi-adjustable dual mounting system for extra strength. Secure and adjustable pin style latch system ensures doors stay shut while riding.Sold in pairs. Rugged nylon safety netting.Easily installs in minutes.